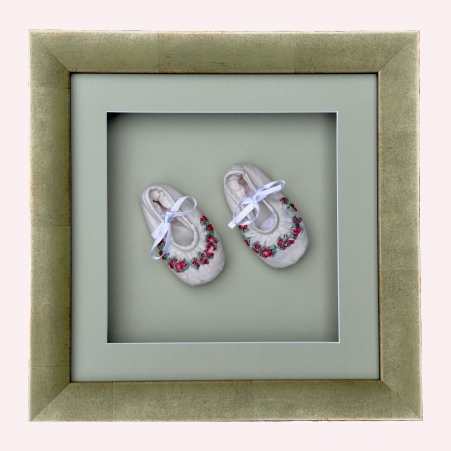 These cute embroidered shoes look really special inside this distressed green/gold frame. The mount colour has not come out in the photograph as well as I’d hoped (the actual colour is much more subtle), but the “shadow” effect of the mount next to the glass and the shoes set well back in a box attached to the back of the frame is demonstrated well. An expensive choice of frame but a really impressive little piece of artwork/memorabilia. Guide price £133 (includes the 3D box attached to the back of the frame).